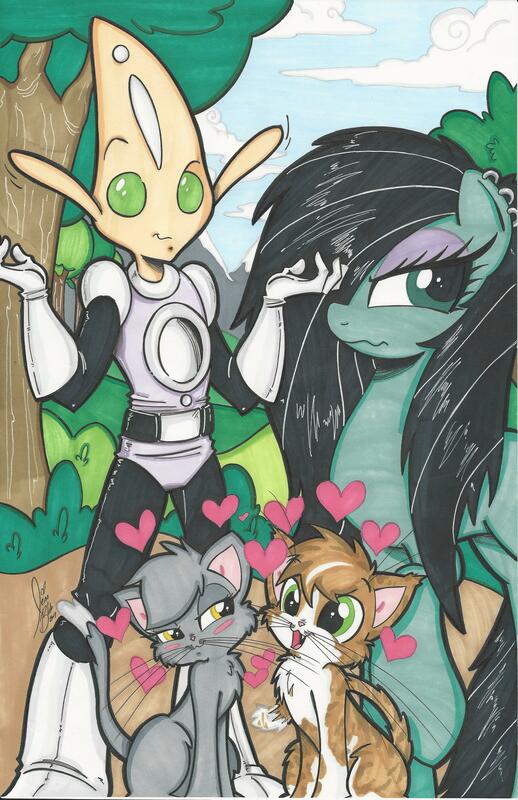 Today’s Albert the Alien ‘summer break’ is brought to us by my good friend (and My Little Pony trading card artist for Hasbro and IDW) Jennifer Blake! Jennifer is actually going to have her first published comic in the recently successfully funded graphic novel Albert the Alien 1: New in School (coming out later this fall in print), which we put together. I wrote a story for her to draw about Albert meeting a cat for the first time (Allergy, Miranda’s cat) and not understanding their quirky nature at all. Jennifer, like me, is a cat owner and totally nailed all of the funny little things that cats do – and how they can terrorize Albert! She also has a HUGE MLP following on her facebook fan page where she has created her own MLP character, Sappho, who is based on Jennifer’s own unique style and artistic personality. Jennifer actually has a background in fashion design, and when we first met in 2013 at Anime Iowa, we immediately hit it off and became very close friends. I can’t wait to share Jennifer’s story with the world this fall when Albert the Alien’s first graphic novel comes out in print, but in the meantime you get to enjoy this awesome piece of art! And check out her other stuff on her fan page – and she also does commissions! “Summer Break” will be wrapping up soon, and we’ll be returning to the Albert the Alien story in August. I hope you’re enjoying all the fan art while we continue to put together the graphic novel, and we can’t wait to get back to telling the story of Albert’s adventures on Earth! This weekend Gabo’s going to be attending SDCC (also called “Comic Con,” for those who aren’t familiar with San Diego Comic Con), the largest comic convention in the country. He’ll be signing copies of The Life After, and also no doubt hanging out at Richard Starkings booth in artist alley. Swing by, get some commissions from him, and say hi. Meanwhile, more towards the middle of the country, I’ll be a returning guest of honor at Anime Iowa. I’ll have copies of my books for sales, original art, doing commissions, and will be doing a number of panels throughout the weekend!